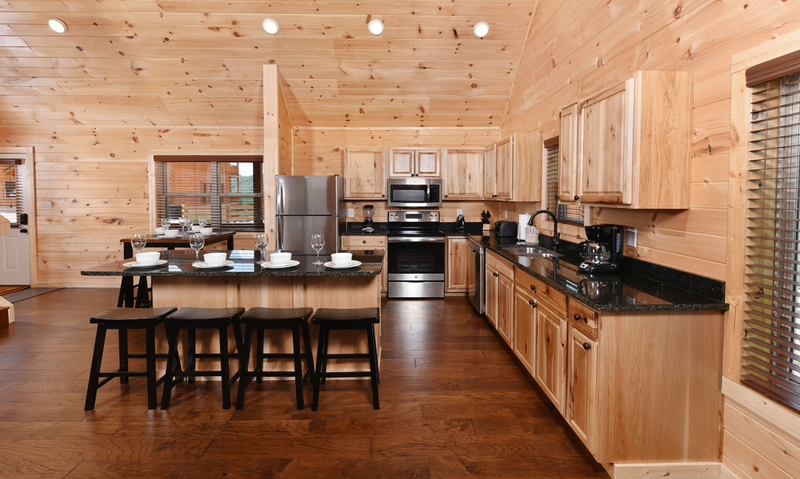 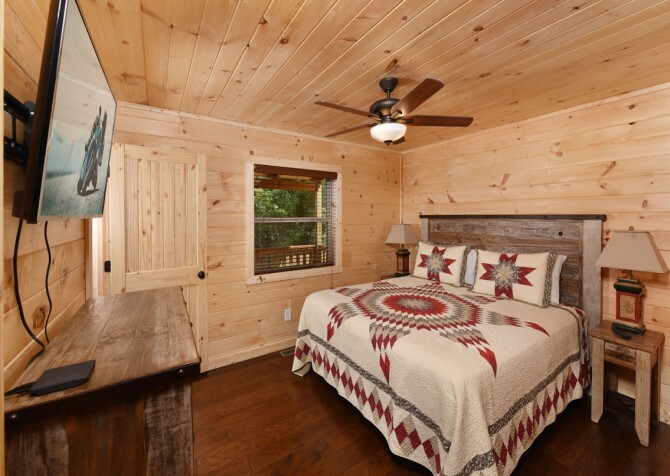 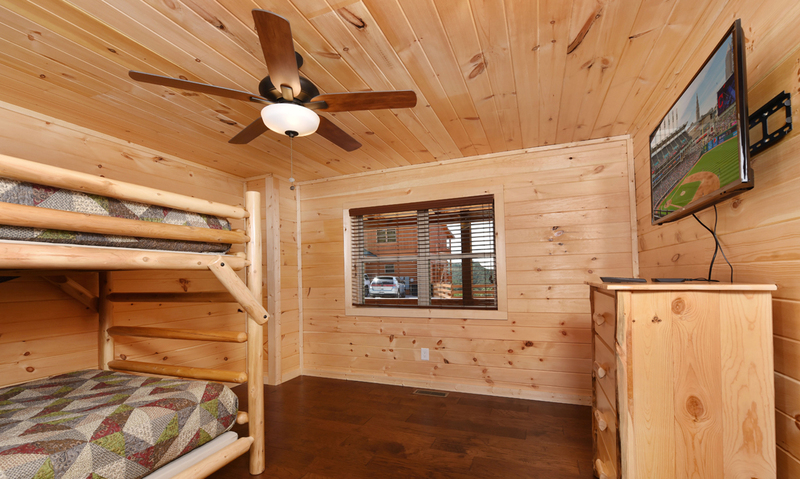 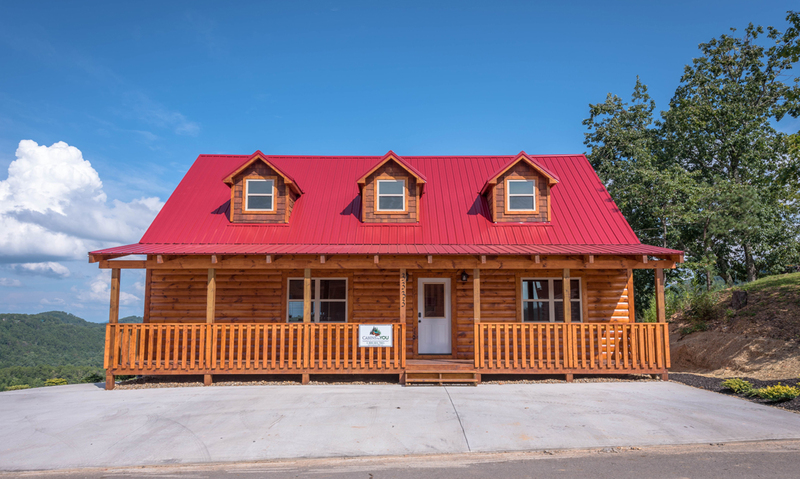 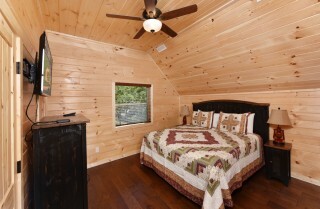 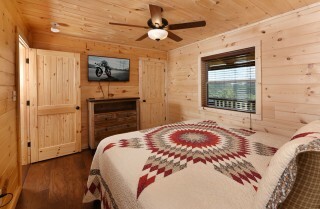 Spend Heavenly Daze at this beautiful newly built 3-bedroom, 2 ½-bathroom, 1850-square-foot cabin for 8 in Pigeon Forge, Tennessee! As picturesque mountain views stretch beyond your back deck, enjoy a cup of coffee from your rocking chair to start your day right. Breakfast is easy to whip up in the fully equipped kitchen, complete with a kitchen island for prepping meals, stainless-steel appliances, and plenty of glasses, dishes, utensils, and tools for creating meals for the group. Days can be spent cozied up by the gas fireplace in front of the big screen TV or playing air hockey and foosball — great for kids and adults! 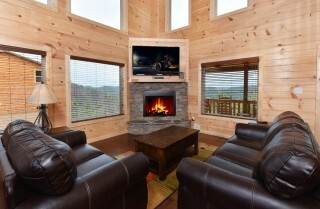 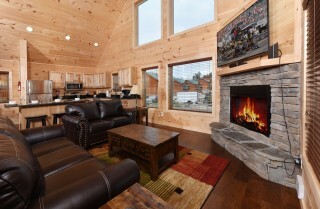 As you unwind in the inviting living room, soak up the sun and mountain views through the many windows found here! 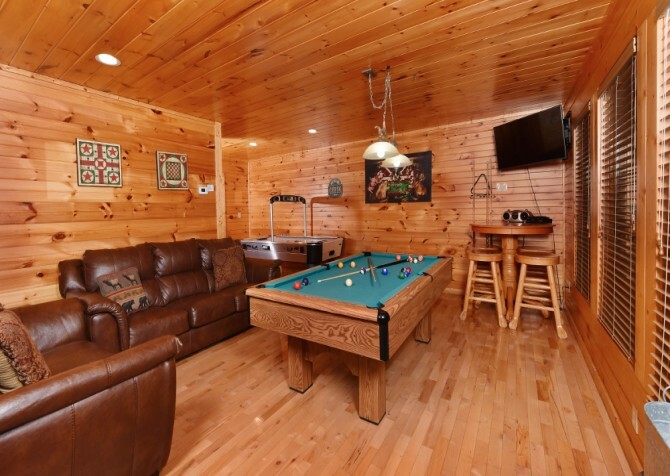 This fun-meets-relaxation cabin is perfect for memorable weekends with friends, fun family getaways, or romantic couples’ retreats. 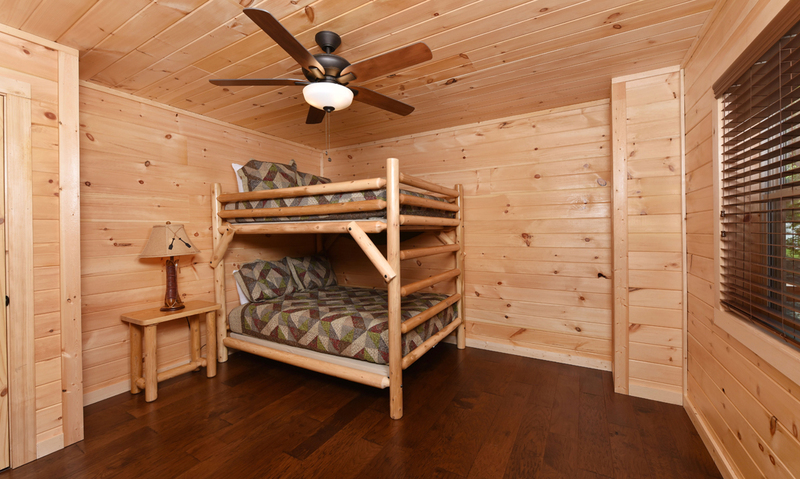 A mix of beds includes 1 king, 1 queen, and 1 full bunk bed. Stone details in the bathrooms add a special touch, and a lovely wood interior gives you that classic cabin experience. 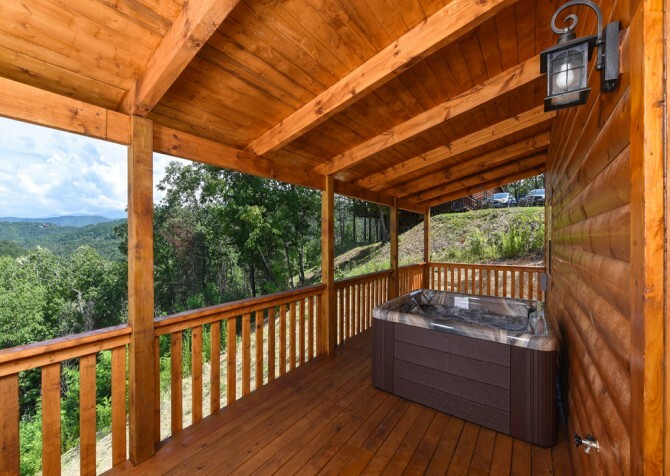 Need some fresh air? 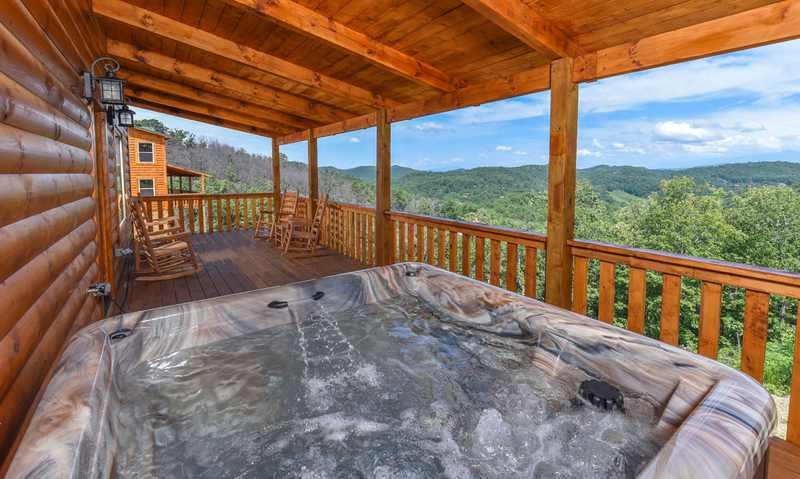 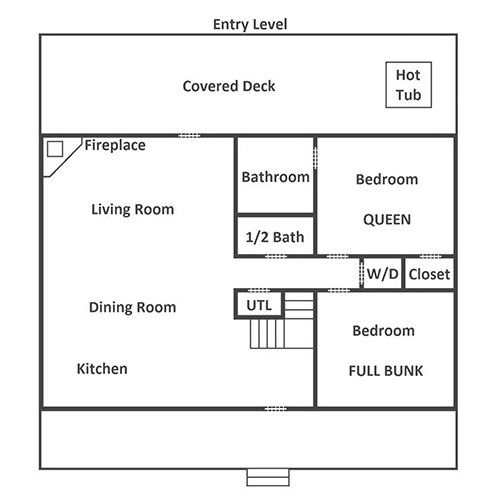 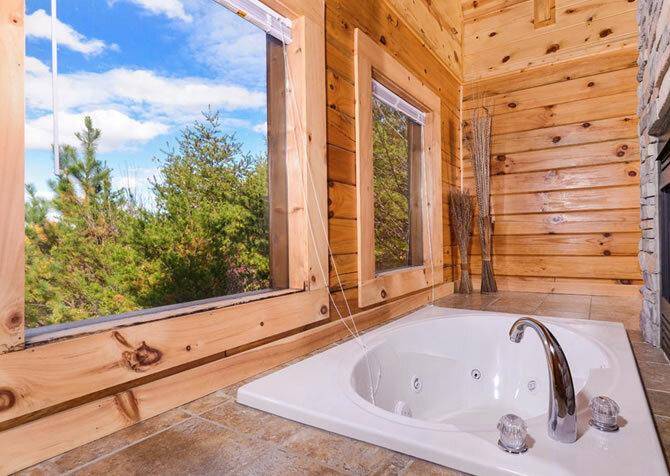 Spend time enjoying the views from the deck or climb into the soothing hot tub to soak away your stresses. 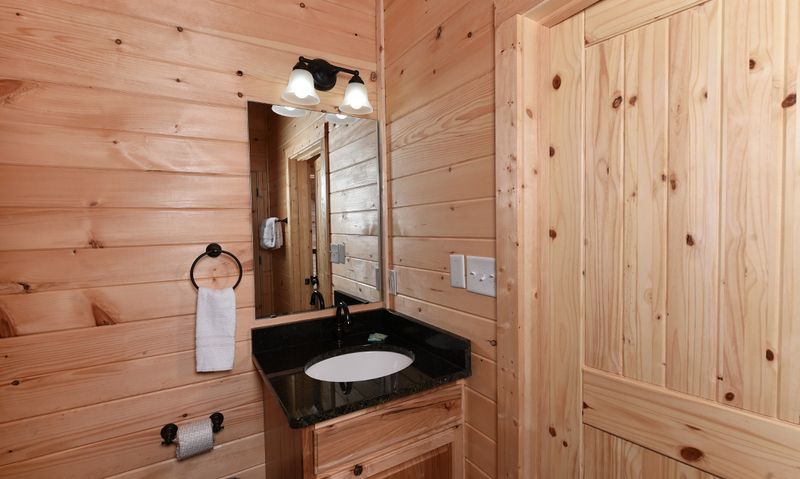 The cabin also has plenty of other conveniences, including wireless internet, a washer and dryer, plus flat parking for easy arrivals. 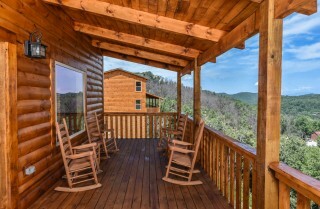 And when you’re ready to explore, head to downtown Pigeon Forge, Sevierville, or Gatlinburg for some fun! 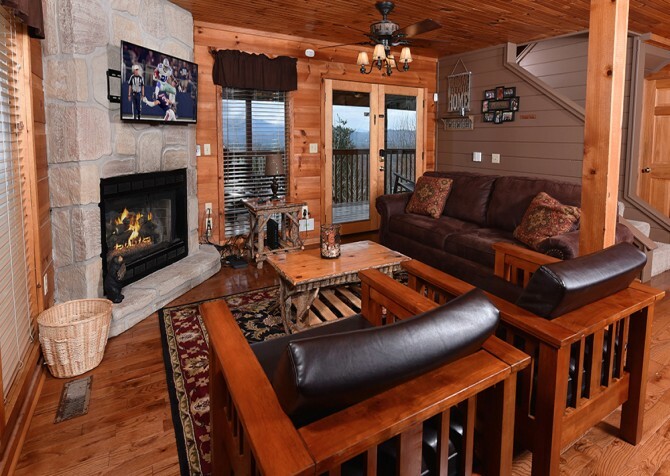 Between restaurants, shops, art galleries, The Island in Pigeon Forge, fun events, and the Great Smoky Mountains National Park, there is no shortage of things to do when you stay at Heavenly Daze! 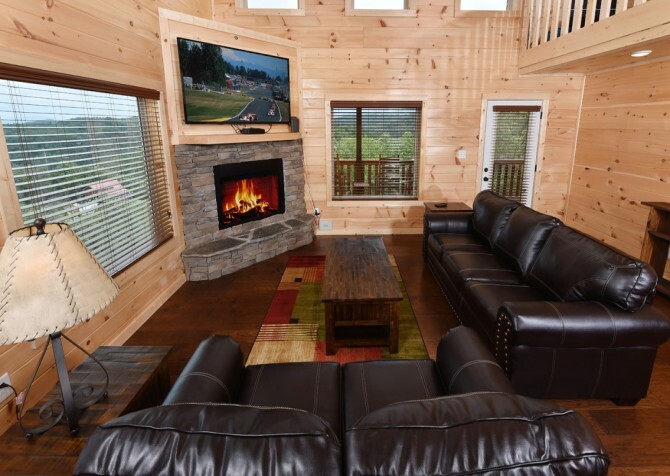 Bright, open, and inviting describes the modern living room at Heavenly Daze, where you’ll find a whopping big screen TV, stone gas fireplace, leather sofas, hardwood floors, and windows galore! Unwind from your travels with a rest on the comfy couches, and when evening sets in, flip on the TV for an epic movie night. 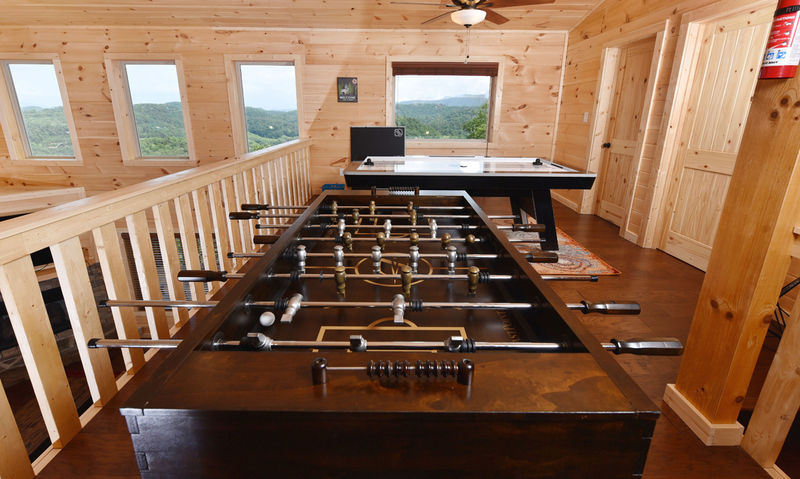 Load the coffee table with snacks and drinks or bust out the board games from home for a bit of family fun. 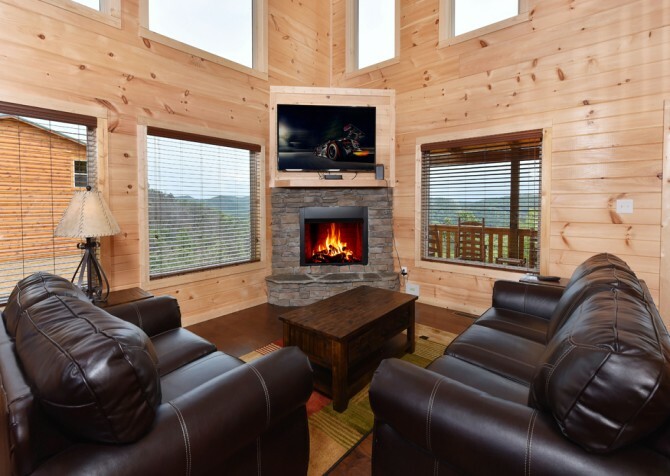 As everyone heads to bed, switch on the reading lamps, grab a pot of joe (yes, a whole pot is allowed on vacation), and enjoy your favorite novel by a mood-setting fire. 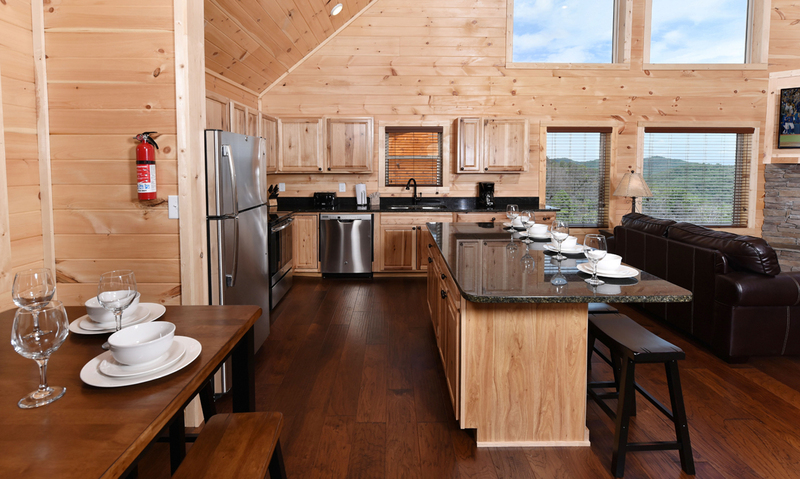 Nearby lies the kitchen, fully equipped with stainless-steel appliances, spacious granite countertops, and meal-prep tools aplenty for hearty breakfasts, lunchtime treats, homemade meals, and midnight munchies. Gather the kiddos at the breakfast bar for 4 to help decorate freshly baked cookies from the oven, wash up in the double sink, store restaurant leftovers in the fridge, pop everyone’s movie-night favorite in the microwave, brew Colombian blends in the coffeemaker, and let the dishwasher take care of the cleanup. Just off the kitchen awaits the dining area for 4, featuring a quality square table with matching stools. Not only great for mealtimes, this space can be used for arts and crafts with the kids, card games with your best buds, or intriguing chats about the newest series release on Netflix. 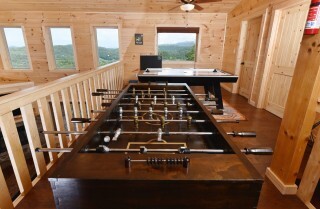 It’s game time in the loft! 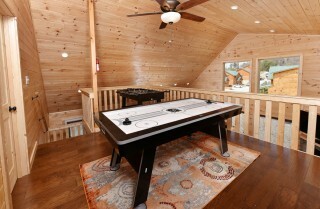 Featuring sleek game tables, the contemporary rec room offers air hockey and foosball. 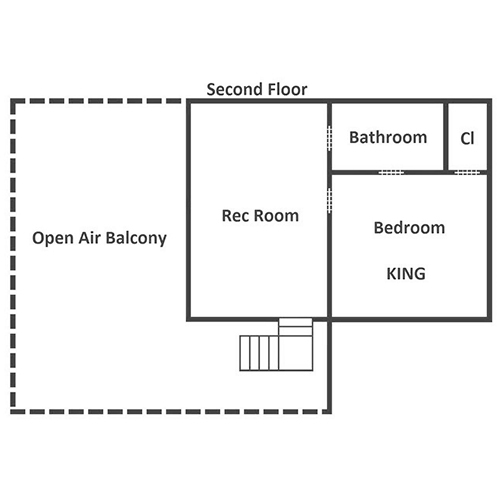 Feeling a bit overheated from intense game battles? 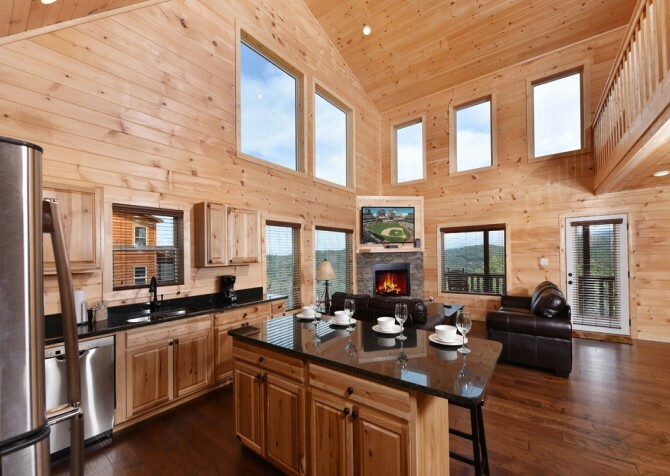 Flip on the cooling ceiling fan and take a breather with breathtaking mountain views through the large windows. 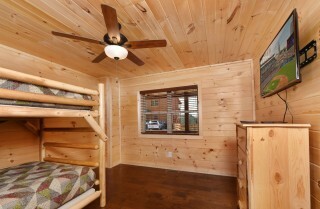 Ah, after spending all day exploring downtown attractions and playing at the cabin, sweet sleep awaits at Heavenly Daze. 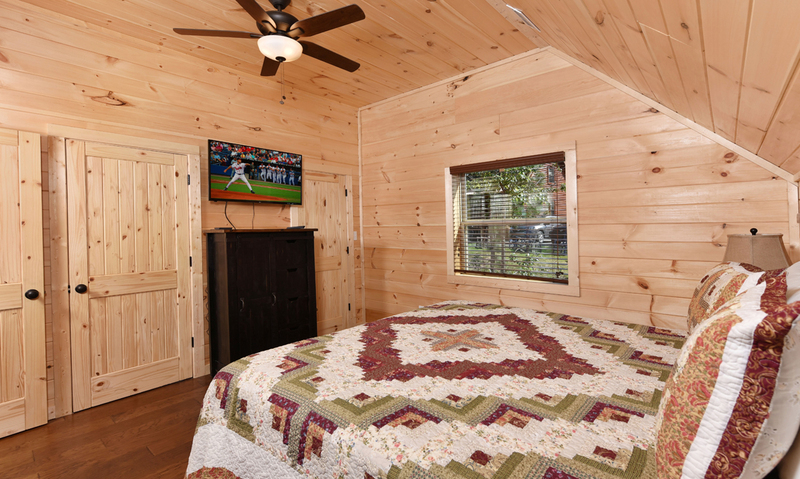 Each of the 3 bedrooms boast a flatscreen TV, ceiling fan, beside lamps, and cozy furnishings, including 1 king-size bed, 1 queen-size bed, and 1 full bunk bed. 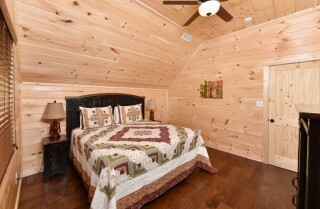 Snuggle with your spouse, enjoy light entertainment, and start a new read before heading to dreamland. Arrive to Heavenly Daze at the flat, paved parking area for 2 and easily unload your luggage with a spacious front porch and only 3 steps into the home. After choosing your preferred room and settling in, head onto the covered back deck, where endless mountain views and relaxing rocking chairs await. There’s even an outdoor hot tub, which you’ll really appreciate after a long day adventuring in town. 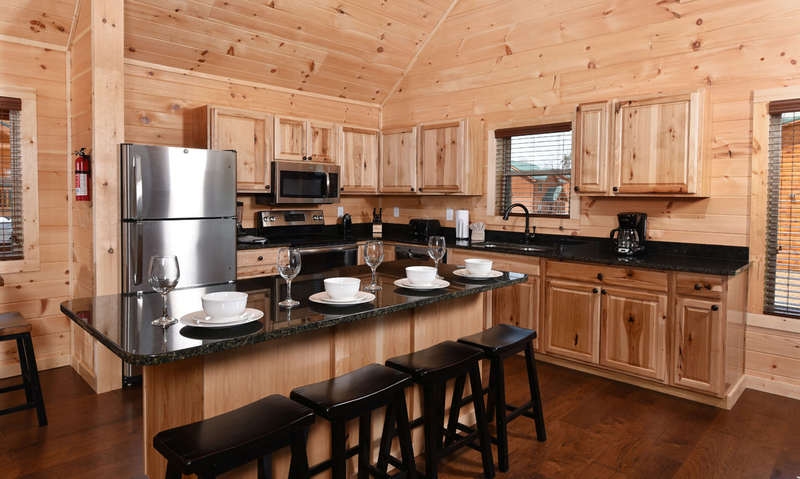 Heavenly Daze also offers complimentary Wi-Fi and a washer and dryer, giving you the homey conveniences you crave while on vacation. Wash clothes after a hike in the national park and check emails with ease anytime. 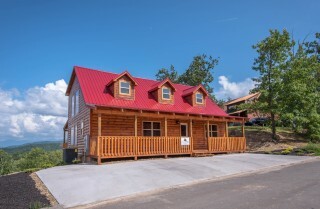 Less than 6 miles to the city center of Pigeon Forge, Heavenly Daze provides a convenient location to local restaurants, shopping centers, and outdoor activities. 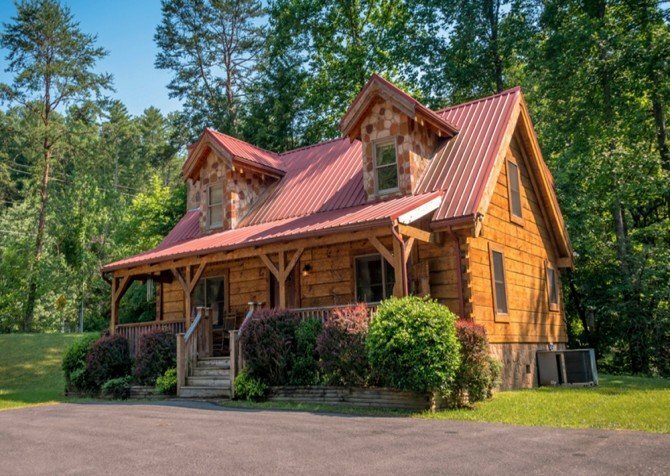 Find treasures and create jewelry to wear home at the Pigeon Forge Gem Mine, an interactive mining experience in the Smokies. 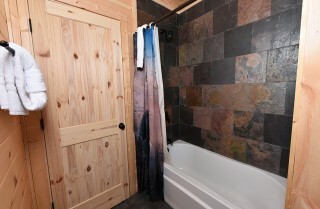 Got a craving for crime and justice? 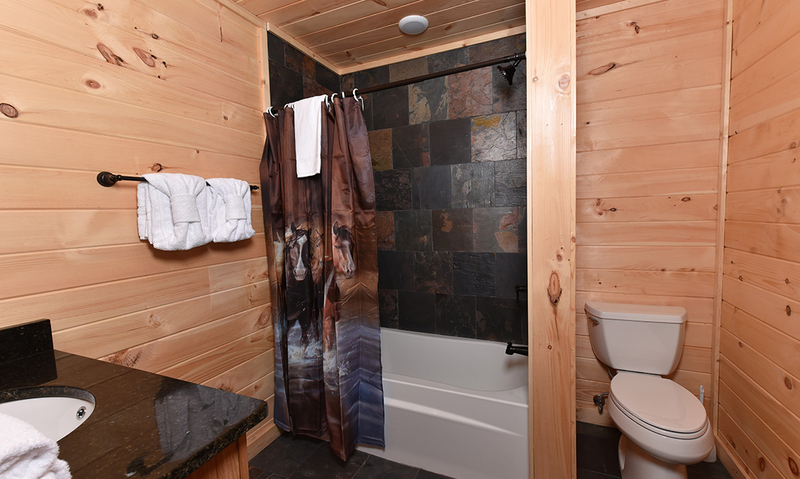 Head to Alcatraz East Museum, where you can take a close look at notorious cases, from famed pirates to Old West villains to modern-day criminals. Play, eat, shop, and smile all day at Dollywood, an amusement park filled to the brim with epic rides, tasty treats, tap-worthy tunes, and Southern charm!